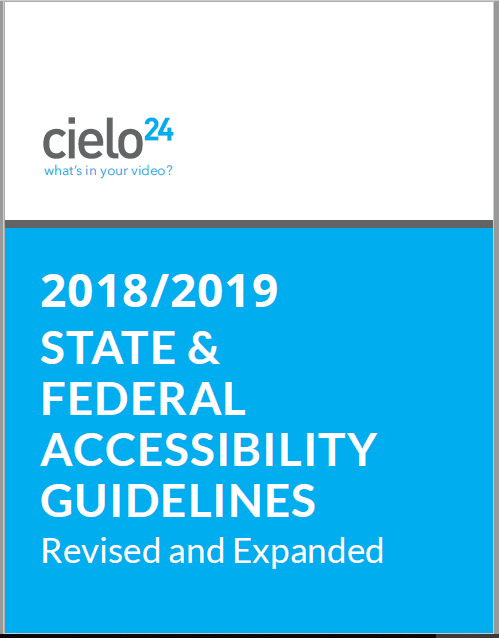 Get the revised and expanded 2018/2019 State and Federal Accessibility Guidelines. Many laws have changed in the last year! The Federal Government has crafted a number of laws that set website and digital accessibility requirements for government agencies, public and private universities, and even many for-profit businesses. In addition to those laws, many states have also drafted their own policies that exceed the federally mandated standards. The 2018/2019 State & Federal Accessibility Guidelines Revised & Expanded has everything you need to know to make online information and programming services compliant with all laws, policies, standards and guidelines. Submit the form to get your copy today. Section 504 and 508 of the Rehabilitation Act – 2018 Updates! Web Content Accessibility Guidelines (WCAG) 2.1 – Published June 2018! All 50 States’ Legal Requirements and Policies – 2018 Updates! cielo24’s cutting edge video data solutions help organizations manage and deliver regulatory compliant videos that create growth opportunities and let your videos stand out amongst the rest. We also offer video data solutions that specifically help universities manage and deliver thousands of hours of online classroom content that meet ADA compliance requirements for education and expand opportunities for online learning.